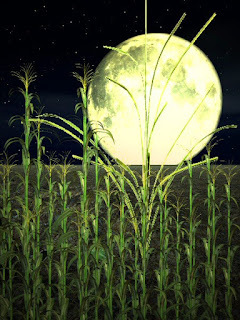 The Super Moon only intensifies it's pull on the Earth - Green Corn Full Moon or Grain Full Moon is the 2nd moon after the Summer Solstice. We are in full swing of getting things ready for the harvest. We are harvesting some of our crops and seeing how good our intentions are and getting other crops ready to harvest. Not a lot of time yet to enjoy our bounty as we still have a lot to do - but we are starting to see what our hard work has given us. For me, I am enjoying my son's successes - starting to let go of my hurt and pain of what my daughter did to me. Coming up with more ideas for my practice and starting to feel better about the direction of my health. I am try to only look at this moment and near future and not obsess about the far future. Hopefully the harvest will be good with the Super Moon glowing above us. Time goes so fast. It is now Lughnasadh. We celebrate together as we all work to bring in the harvest. I am struggling with how to come to terms with my relationship with my daughter. I have been working to let go and to focus on other things - but I cannot help but wish things had ended better. I do not want to enable her and yet the system does that. I focus on my son doing well though - in a few days he will be back from his summer job and I look forward to seeing him a bit more. Another year is just about to start with school and a crazy work schedule as my clients come back from vacations. The harvest kind of feels disorganized this year but maybe when you are working to bring in the harvest you are just a bit overwhelmed by the magnitude of the harvest and the work it takes. Change is hard but sometimes we need it.